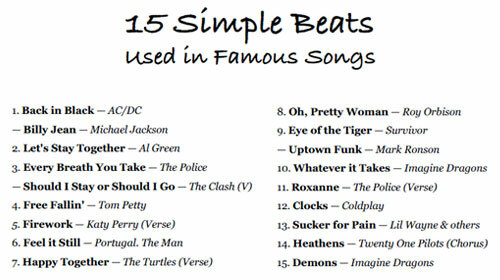 • Thank you again for your interest in my OnlineDrummer booklet, Funk Up Your Hi-Hat Part I. Part II is now available. As I’ve mentioned before, the profession of drum teaching definitely has two sides to it. You of course become devoted to helping your students. In addition, if you pay close attention, your students teach you a thing or two (or five). One of my students, Dan Gurka, has again filled me in on an example of a great new band and their creative drummer. I’ll Take the Minute, Snake is a song by UK math rock band, This Town Needs Guns (TTNG). 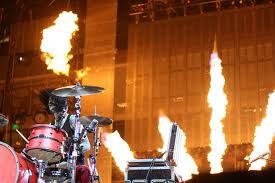 The drummer responsible for concocting the clever drum parts is Chris Collis. Here is a YouTube video of a live version. Dan was mostly interested in the bridge starting at the 2:48 mark, but the teacher inside caused me to go ahead and transcribe and analyze parts of the intro/verse, the chorus, and the bridge. I hope you find this worthwhile. It was good for me! Collis designs a unique calypso groove here. 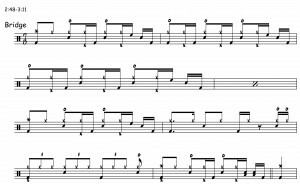 The right hand plays time on the rim of the floor tom (and moves between the floor tom and the rim of the high tom), while the left hand plays accented and ghosted notes on the snare (and moves to the rim of the high tom). The left foot taps out hi-hat chick quarter notes. This patterns both melds with the simple bass line and contrasts with the Afro-Pop meets King Crimson arpeggiated guitar line and chanted vocal melody. Collis makes some smart sound-driven decisions here. 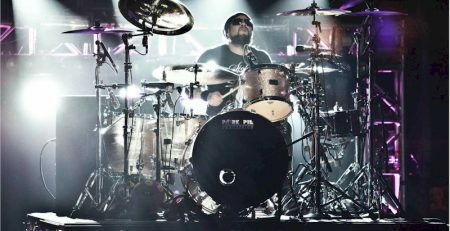 High frequency rim clicks (and left-foot chicks) contrast nicely with mid-range snare hits and low frequency floor tom and bass drum notes. 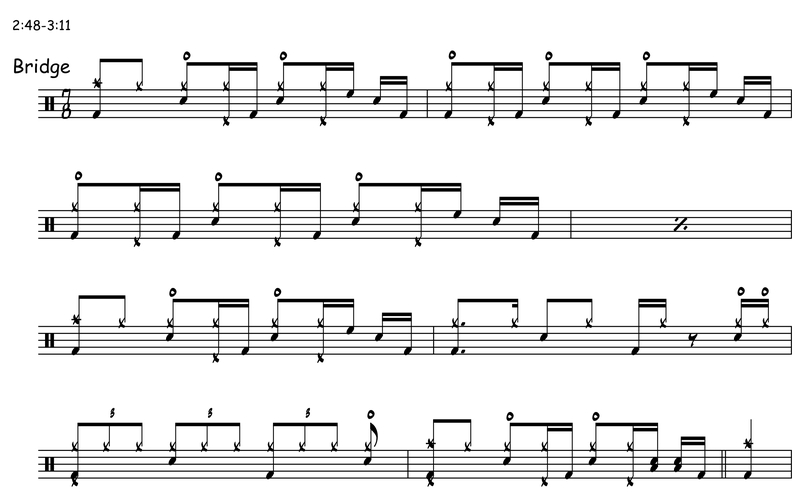 The fill in the fourth measure (flat flams between the rims) is similar to an Afro-Cuban cascara pattern (often heard played on the sides of the timables). Now that we’ve cleared up the math, the drum pattern itself, has a nice rudimental Latin feel to it. The pause on beat 2, followed by the ghosted LL on the snare is the key to the great forward momentum in this groove. Just as in the intro/verse, the way that Collis orchestrates the pattern around the kit makes it come to life. The bridge is a duet in 7/8 time between the drums and bass. The bass lays down the following 7/8 foundation: 2 + 2 + 3. (Here comes the math again!) 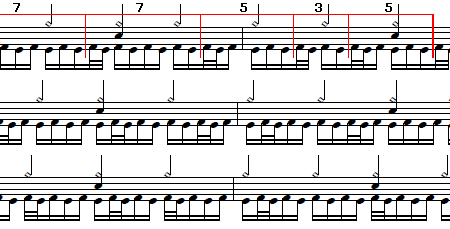 Collis creates a really funky groove in the first five measures with open hi-hats on the beat and three linear notes at the end of each of these measures supplying the connective tissue. Measure 6 uses space and syncopation (and a polyrhythmic feeling), while the triplets in measure 7 create a short tinge of a metric modulation. Measure 8 returns back to the funk of the first five measures. Note: If you don’t have experience with it, 7/8 time (and other odd time signatures) can be confusing. 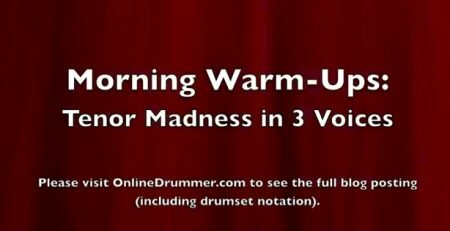 Ask a drum teacher for help or find another resource (My books Drumcraft, Daily Drum Warm-Ups, and Drum Aerobics all provide assistance with odd-time reading). Just as I brought up in my article on creative drumming in the July 2013 issue of Drum! Magazine, it is my hope that more music like TTNG will spring up, replacing some of the bubble gum that I often hear while working out at the gym. Playing the “Herta” pattern in groupings of 3’s, 5’s and 7’s.